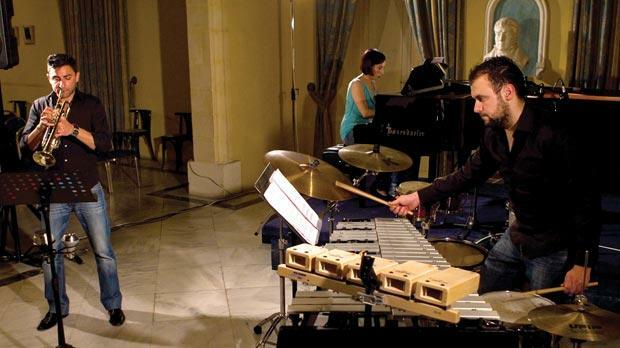 This well-attended recital at the Sala Isouard, Valletta, was part of the International Spring Festival, dubb­ed ‘Diversity’ because of the open nature of the Crossbreed Ensemble. It was ‘open’ because of the formation and number of musicians: this evening’s featured pianist Tricia Dawn Williams, trumpeter Kevin Abela and percussionist Daniel Cauchi. They are among our best young musicians and gave a fine performance which was fun to experience. The pianist did not feature in two works, one was Rebons B by Xenakis in which Cauchi, from a relatively monochromatic start to a steady rhythm, built up a climactic and very tense diversity of sound which had a touch of primeval beauty about it. In the opening work, the ensemble performed Clint Mansell’s Lux Aeterna from Daniel Aronofsky’s cult film Requiem for a Dream. Right from the start, this work showed clearly the great rapport between the performers. The trumpet sounded the haunting theme and was dominant in voicing it with piano and percussion mainly concerned with keeping up an ostinato rhythm which contributed to the projection of a sense of mystery and peace. Ħarba, for piano and trumpet was the first of the evening’s two works by Ruben Zahra. The title could mean a kind of tag played by Maltese children, or more likely from the nature of the music, a flight, a quest for escape from some perceived or real danger. The tension brought about by some ominous threat was well-projected by the restlessness in the piano part and the jagged playing of the trumpet, with both instruments generally following a different pace with tempo coinciding but rarely. The other Zahra piece was Fragments, for piano and percussion, a vibrant piece which seemed all too short and over too soon just as one realised how much one liked it. Another duo work was Born To Beat Wild by the highly prolific Nebojsha Jovan Zivkovic, trumpet and bass drum. The latter was placed on top of a padded low stool so as to obtain the desired effect. It is a very fine example of dialogue between the instruments in which initially it is the frequently virtuoso trumpet which has most of the limelight. Eventually the drum gradually moves in and continues along on a more equal footing, with the work ending in an exciting release of irrepressible energy. The only solo piano work was a set of Three Irish Legends by Henry Cowell, my second live experience of the set, the first having been also performed by Williams. Obsessive and mantra-like in The Tides Of Manaunaun the mystic air conveyed by the legends continued in The Hero Sun and The Voice Of Lir. This was extremely powerful and well-projected music in which the pianist not only played with her fingers but in the first legend also produced crashing chords using her left forearm, the right one in the second legend and both of them in the last legend. All three musicians were involved in the highly charged Phantom Of The Opera by Steve Harris (Iron Maiden) which closed the concert. The encore was of a work which had been performed in the recital’s first half. This was a humorous piece: Zahra’s arrangement of Dave Franklin’s Merry-Go-Round Broke For A Looney Tunes/Bugs Bunny Cartoon. The work quotes fragments from Beethoven, Suppé, La Cucaracha, It’s Got To Be You, Ochi Chyornye and others. Great fun indeed.